We tried Madhur Jaffrey’s Royal Lamb Kaati Kebab (Shahi Kaati Kabab). This is Indian streetfood. Boneless lamb is marinated in ginger, garlic, ground coriander, cayenne pepper and lemon juice. 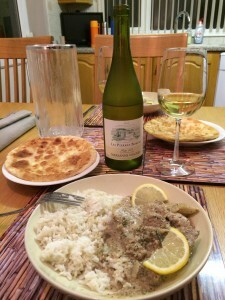 The lamb is fried with the marinade, onions and chickpea flour, rather than grilled. We garnished with fresh mint and coriander and enjoyed with an onion salad, yoghurt and chapattis. 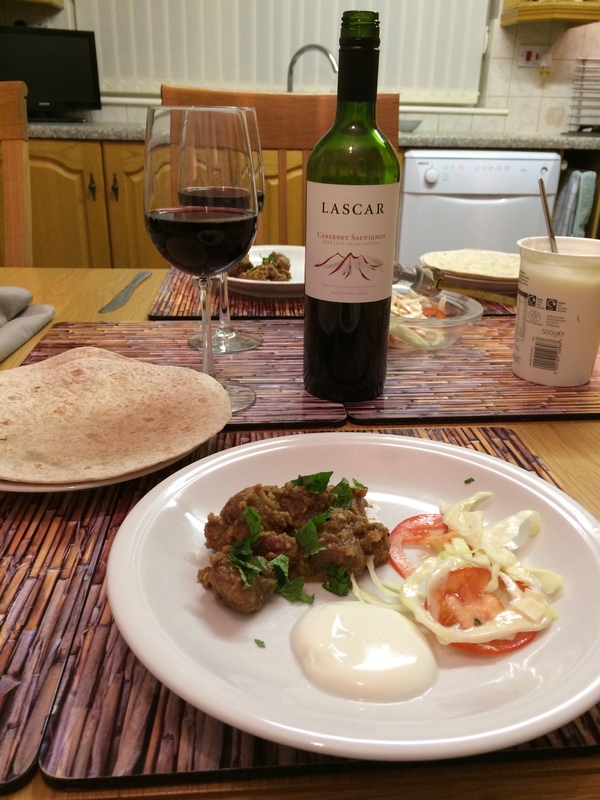 We paired this strongly flavoured dish with a bottle of Lascar Cabernet Sauvignon 2012, a medium-bodied Chilean red from the Wine Society. We tasted black fruits, especially cherries with vanilla sweetness. 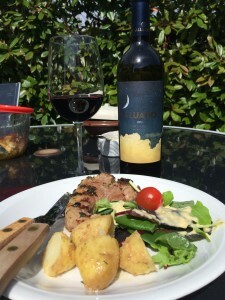 The wine stood up well to the strong flavours of the meal and was a very good match. Lamb and Cashew Nut Curry from Supercook requires the blending of ginger, garlic, green chillies, cashew nuts, cloves, coriander seeds and white poppy seeds into a spice paste. Cubed lamb is then cooked in the paste along with yoghurt, saffron, salt and lemon juice. The dish is garnished with lemon slices and fresh coriander leaves. We served the curry with parathas and rice. 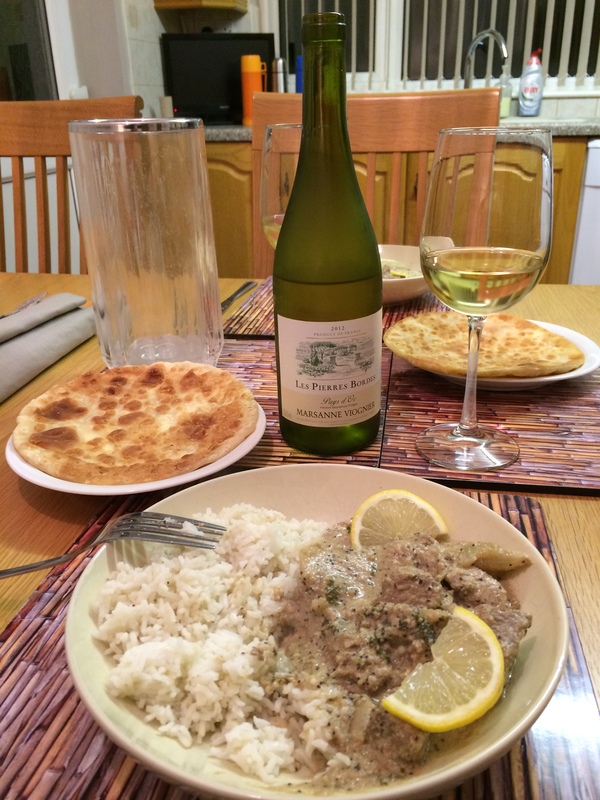 We thought a white wine would be best and opened a bottle of Les Pierres Bordes Marsanne-Viognier, Pays d’Oc 2012. This is a Southern French white from the Wine Society. The wine was very slightly off-dry, fruity with creamy peaches and melon flavours. It also had a lovely tangy spiciness to complement the flavours of the curry. A very good match. 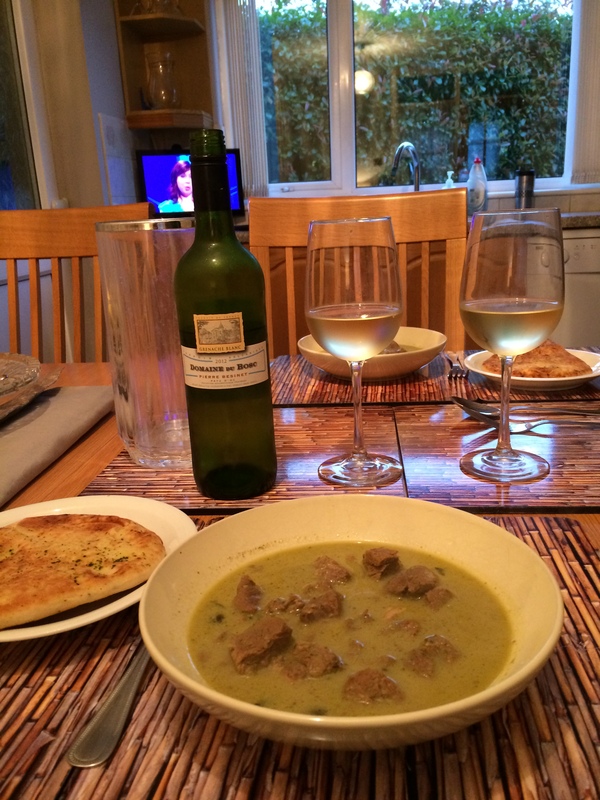 We tried a Sri Lankan dish called Lamb Curry with Fresh and Dried Coriander from Madhur Jaffrey’s Curry Bible. The recipe requires grinding mustard seeds, peppercorns, coriander seeds and cloves and blending shallots, ginger, garlic, coriander leaves and chillies. The lamb is fried in cinnamon, cardamon, curry leaves and pandanus leaf. Unfortunately nowhere local to us stocks pandanus leaf. However, we read that bay leaf with a little dried basil can be used as a substitute. The lamb is then cooked in the ground and blended spices together with water, turmeric and lemon juice. Coconut milk is added at the end. 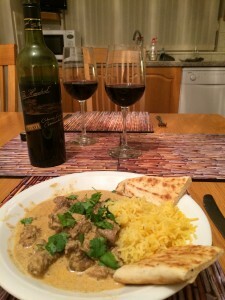 We served this delicious aromatic curry with naan bread. 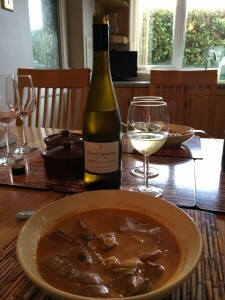 We thought a slightly off-dry wine would work nicely and opened a bottle of Domaine du Bosc Grenache Blanc 2012, a southern French white from the Wine Society. We tasted creamy peaches, a slight sweetness, citrus and a smooth finish. The wine was a very good match with the curry. For a quick and easy midweek meal we cooked lamb chops with tomatoes and herbs from Supercook. The chops are baked in the oven with a mixture of canned tomatoes, tomato purée, paprika, basil and marjoram. 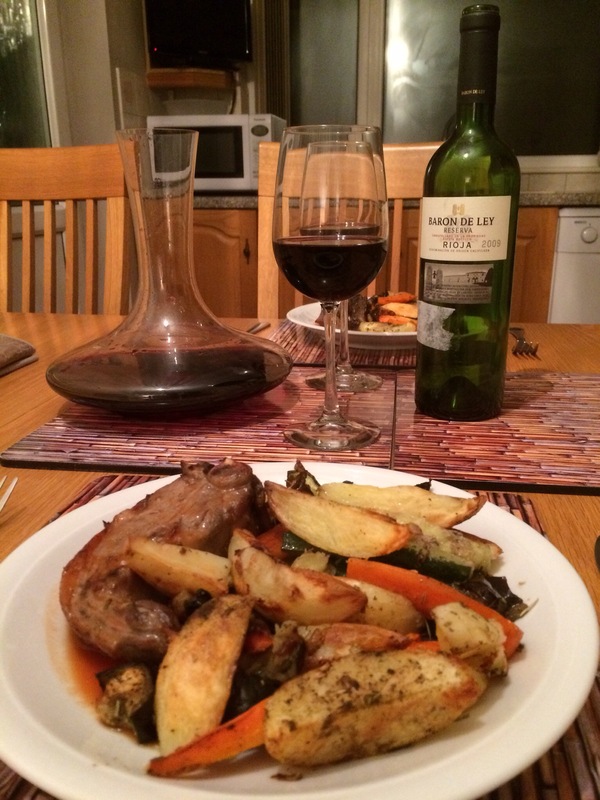 We served the chops with carrots and roast potatoes. 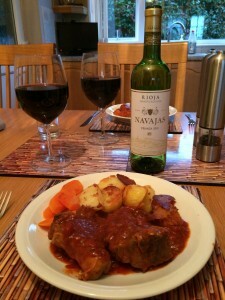 We opened a bottle of Navajas Rioja Crianza 2010, a medium to full-bodied Spanish red from the Wine Society. We detected red berries and vanilla on the nose and then intense red and black fruit flavours. The finish was long, smooth with spiciness and vanilla. We thought this lovely wine was a perfect pairing with the lamb chops. We tried Hyderabadi Lamb with Tomatoes (Timatar Gosht), a very good Indian recipe from Madhur Jaffrey’s Curry Bible. Cubed lamb is marinated in ginger, garlic and turmeric and then cooked with onions, tomatoes, green chillies, curry leaves and fresh coriander. We served the curry with Indian breads and rice. 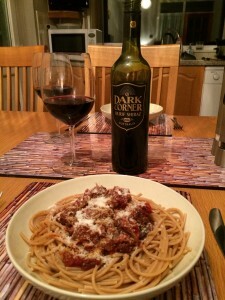 We chose a bottle of The Red Sedan Oak-Aged Shiraz 2008 to accompany the meal. This is a full-bodied Australian red from the Sunday Times Wine Club. We detected black cherries on the nose, followed by smooth, rich black fruits , spiciness and a velvety chocolate finish. The wine was a good match with the meal. A couple of days later we finished the remainder of this dish and the flavours were far more intense. We opened a bottle of Tesco’s Finest Valle de Colchagua Carménère 2013, a full-bodied Chilean red. 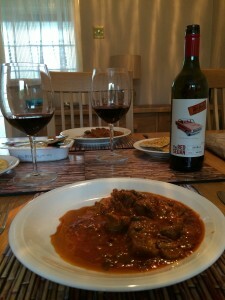 This displayed powerful red fruits and spice, but surprisingly it overwhelmed the curry, so we set it aside. 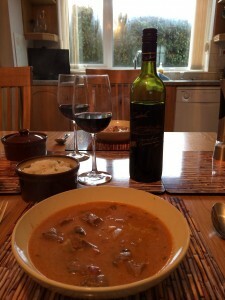 We turned to a bottle of Campo Viejo Rioja Reserva 2008, a Spanish red from Costco. This was smooth, velvety, with vanilla red fruits, spiciness and some complexity. The wine was a good match. For a change we decided to cook something from Caribbean Food Made Easy from Levi Roots. We chose Lamb Carry, which is cubed lamb cooked with onion, garlic, canned tomatoes, thyme, basil, cloves, nutmeg, cinnamon, chicken stock, coconut milk, cream and lime juice. We served the meal with Levi’s rice and peas, which contains basmati rice, spring onion, garlic, thyme, allspice berries and red chilli. However, we substituted dessicated coconut instead of fresh and we omitted the black beans. Appropriately we enjoyed some Reggae in the background. If the meal sounds like a wine pairing challenge, you’d be right. Red or white? We tried a red first off and opened a bottle of The Hundred Coonawarra Cabernet Sauvignon 2011 from Sunday Times Wine Club. Nice wine, but not with this dish, so we set it aside. We switched to white and opened a bottle of Concha y Toro Corte Ignacio Riesling 2012, a Chilean white from the Wine Society. This had a grassy aroma and we tasted zesty tropical fruits and a lemony finish with some minerality. This was a good match, especially with the sauce. A couple of days later we tried the leftovers with a bottle of Brancott Sauvignon Blanc, a New Zealand white from Costco. 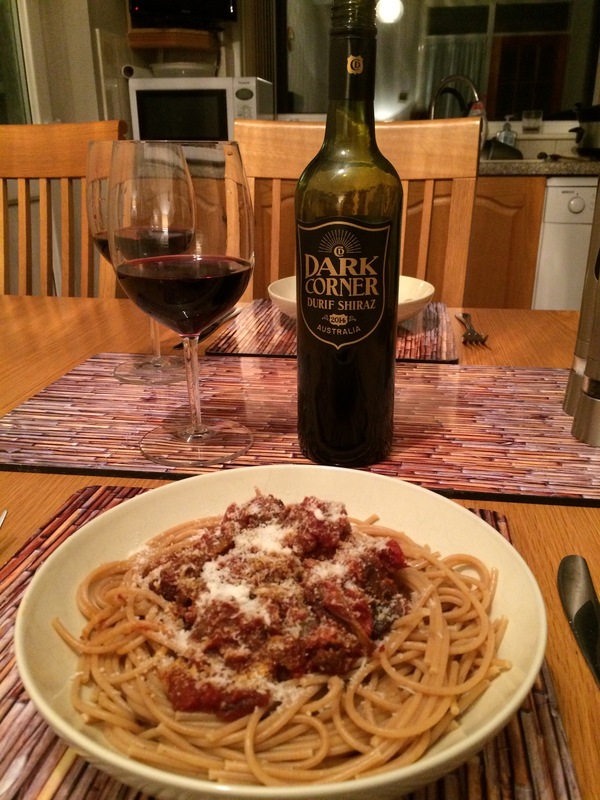 This didn’t work at all and we went back to red and tried a bottle of Luis Felipe Edwards Merlot Reserva 2013, a full-bodied Chilean red from Asda. The plum and cherry fruits with chocolatey sweetness from oak worked well with the meal. A good match.